The Corporation for National and Community Service has included Ithaca College on the 2015 President’s Higher Education Community Service Honor Roll, which recognizes institutions that support exemplary community service programs and raise the visibility of effective practices in campus-community partnerships. Ithaca College’s Office of Student Engagement and Multicultural Affairs (OSEMA) and Office of Civic Engagement work together to coordinate volunteer community service by students and campus organizations. The college also has a number of scholarship programs that require students to take leadership roles in community service, including the Martin Luther King and Park Scholar programs. More than 5,000 IC students — some 77% of the full-time student population — engaged in community service of some kind locally, regionally, nationally or internationally in 2015, putting in nearly 50,000 total service hours. Among the volunteer programs run by OSEMA are Alternative Fall and Spring Break trips, Summer Service trips, Service Saturdays, and the Community Plunge for incoming first-year students. IC Student Volunteers for Special Olympics, in which students coach sporting events and raise funds for the local Special Olympics program, along with raising awareness of and respect for those with special needs. IC Circle K International “Reader is In” Program, in which students read with a child at the Tompkins County Public Library, giving the child an opportunity to bond with their volunteer reader and helping them develop a love for reading at an early age. IC Art for Service, which seeks to use art as a way to make a difference in the lives of local youth, working primarily with the Ithaca City School District, Greater Ithaca Activities Center, First Friday Art Night in Ithaca and Southside Community Center. Volunteers also make holiday cards for military veterans, those living in local senior residence facilities and hospitalized children at Cayuga Medical Center. 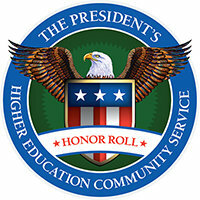 The Corporation for National and Community Service has administered the Honor Roll since 2006 in collaboration with the U.S. Department of Education and U.S. Department of Housing and Urban Development, as well as the American Council on Education, Campus Compact and Interfaith Youth Core. For more information, visit nationalservice.gov/honorroll.